You may think New Orleans is only known for Mardi Gras and its general party-like atmosphere but when you move beyond those elements, the city is known for something else that stands out. Food. Varied, delicious morsels. 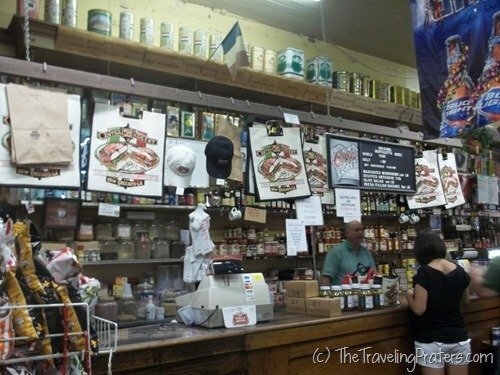 There certainly is no shortage of different foods to eat in New Orleans. Ask anyone what you need to do or see in New Orleans and chances are their suggestion will include something tasty. Perhaps they’ll suggest you sample beignets, a traditional New Orleans coffee house pastry. Beignets (or ben-yays) are deep-fried squares of dough sprinkled with powdered sugar. They may not sound like anything special, but after returning home from New Orleans, I’ve found myself dreaming of beignets on more than one occasion. 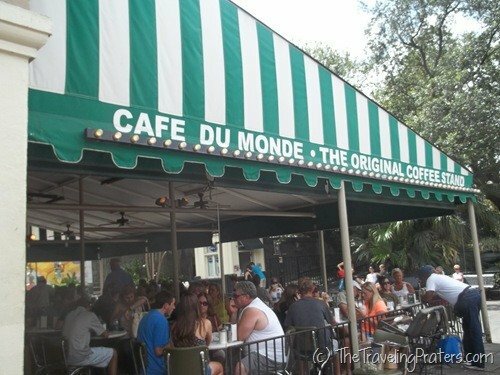 You’ll find this delicious French-type doughnut at various places around the city but if you want the total experience, you must visit The Original Cafe Du Monde at 800 Decatur Street located in the French Quarter. This store has operated since 1862. Today you’ll find it open 24 hours a day, 7 days a week, closing only for Christmas or when it finds itself in the path of a hurricane. It doesn’t matter what time of day you arrive, you’ll likely find tourists lined up to purchase the beignets. Don’t let the crowds scare you away- this is one organized operation. 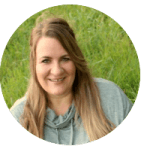 They know how to handle busy and don’t leave their customers waiting. 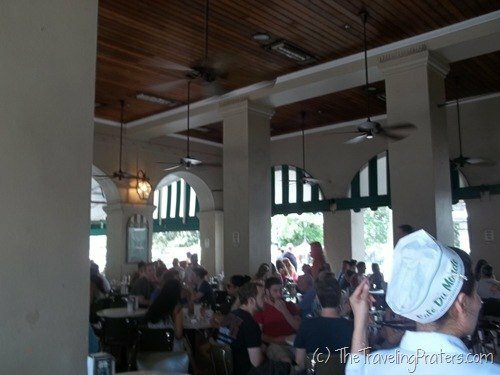 Cafe Du Monde has several locations located throughout New Orleans, but if you aren’t planning a trip to the city, you don’t have to feel left out, Cafe Du Monde ships beignet mix worldwide. 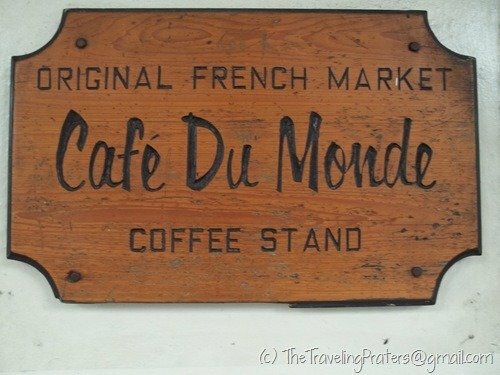 * Don’t forget your quarters and pennies when visiting Cafe Du Monde. 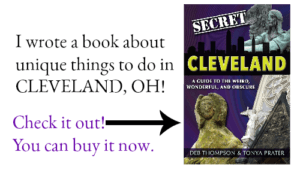 They offer two penny pressing machines, the perfect inexpensive souvenir. A Muffuletta from Central Grocery Co.
Up the street from Cafe Du Monde , at 923 Decatur, is Central Grocery Co. where Salvato Tusa invented the Muffuletta in the 1930’s. The Muffuletta is a thick sandwich served on a round, crusty, Sesame Seed topped Italian Bread with layers of ham, salami, cheese and olive salad. One sandwich is really large and can easily serve two or more people. I’d even say half a sandwich can serve two people, but if you’re extra hungry, you may want to go ahead and buy the whole sandwich. 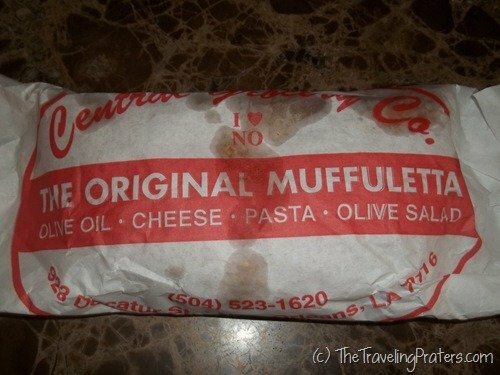 Also located within the French Quarter, the Muffuletta’s served at the Central Grocery are well-known and you can expect to see crowds forming around lunchtime. Never fear, the sandwiches are prepared in advance and you simply tell those working behind the meat counter if you want a whole or half. The grocer provides limited space inside to eat your sandwich, never fear, if a table isn’t open, the sandwiches come wrapped to go. I had my misgivings about this sandwich. I don’t like olives, so naturally, a sandwich where one of the main ingredients happens to be olive salad is not a natural choice for me. Still, this sandwich was so highly recommended that I thought, “What the heck?” Turns out, the Muffuletta is really a great sandwich! 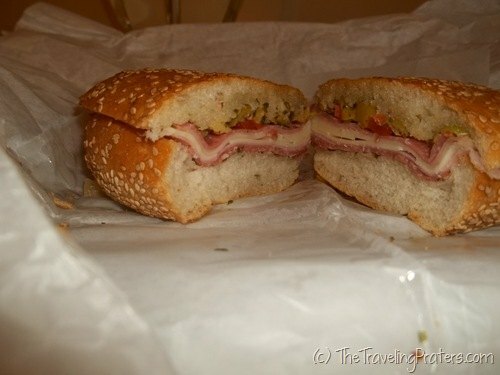 So, for what it’s worth, from a skeptic, give the Muffuletta a try. It’s well worth it! * The olive oil in the Muffuletta can make the sandwich a bit greasy, so grab some extra napkins. 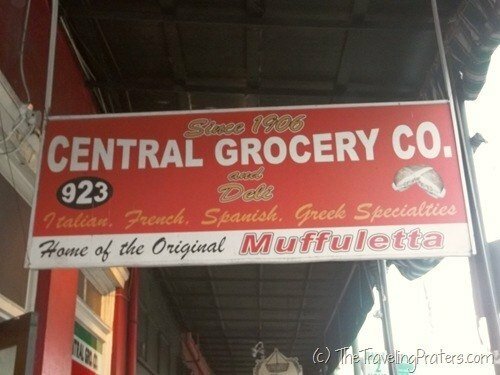 * If you’re visiting on a Sunday, you’ll have to grab a Muffuletta from another grocer, Central Grocery Co. is closed for the day. 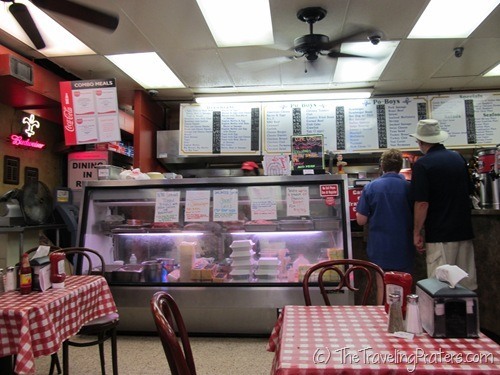 Johnny’s Po-Boy Restaurant is home of the famous Po-Boy sandwich. 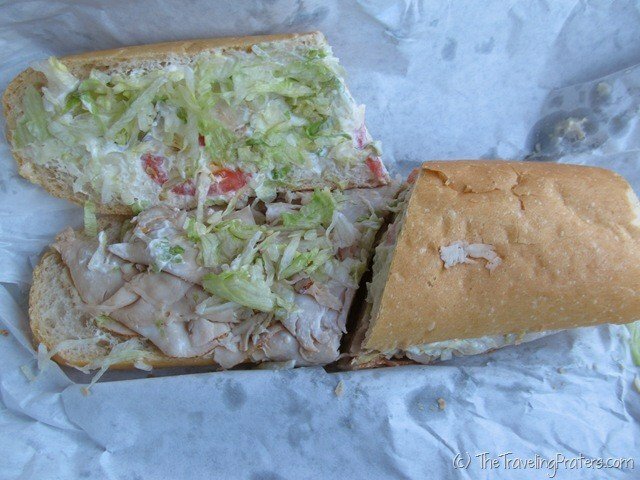 Invented in New Orleans in the 1920’s, the sandwich was created to feed the “poor boys” who were unable to afford a larger meal. Johnny’s Po-Boy Restaurant opened in the 1950’s and today is the oldest family owned po-boy restaurant in New Orleans. Stepping into the eatery, you’ll feel as though you’ve stepped inside an old time deli. The simple tables with red checkered table clothes lend to the diner feel. Don’t let this picture fool you, I snapped it just as both tables cleared out. Like the other popular French Quarter eateries I’ve mentioned, Johnny’s is quite a hopping place. There is a huge selection of po-boy sandwiches to choose from, ranging from soft-shelled crab, alligator sausage and catfish to roast beef and turkey. You’ll find dozens of sandwich combinations or what Johnny’s boasts as the largest selection in the city. I tried the Turkey Breast Po-Boy “dressed” with mayo, lettuce, tomatoes and pickles. The flaky French bread sandwich that seemed to taste better and better with each progressive bite. 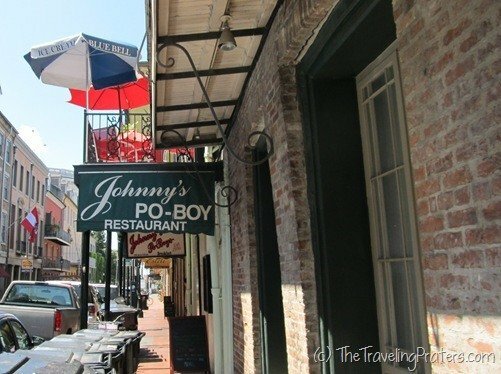 Johnny’s Po-Boys Restaurant can be found at 511 Saint Louis Street in the French Quarter. * Johnny’s is a very busy place and the menu choices can be overwhelming. Take a look at the menu posted outside the restaurant to help narrow down your choices before stepping up to the lunch counter inside. 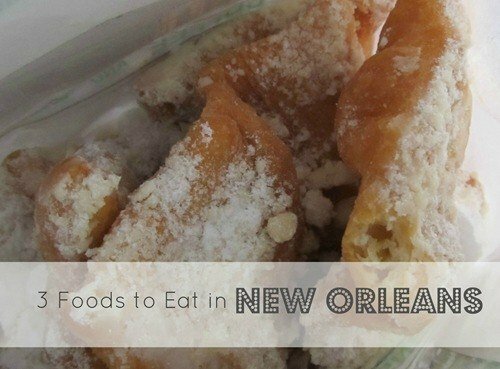 Here are three delicious foods that I enjoyed and highly recommend if you plan to visit New Orleans. What would you add to the list? Yummy! I’ve had the beignets and the muffaletta but not that particular Po-Boy. When we were in Japan at Kyoto Station, we ended up eating at a Cafe du Monde there. Despite all the T-shirts with the word “Beignets” that the staff was wearing, beignets weren’t actually on the menu. False advertising! Oh, yes! I remember being young and in N.O. and having to ask the man what a Po-Boy was having never heard of one before! LOL I love Muffulettas!! Why am I always looking at food before I start making dinner? This is how I end up making too much food! I’d love to try an authentic gumbo!